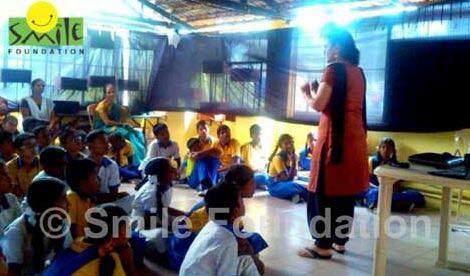 A motivational and stress-busting workshop was conducted for children of Smile Foundation’s Mission Education centre Sukrupa in Bangalore, Karnataka. Dr. Geetha Patil and Dr. Preethi Galgali talked to the children about the different problems they face in their everyday lives and how to deal with these issues in a positive way. The workshop was designed in a way that the children had a lot of fun while learning. It was made interactive through games, quizzes and question answer sessions. The trainers advised the children to share their problems with their parents and teachers without hesitation. Such sessions with professionals are regularly conducted to help the children cope up with the problems in their lives.